With or without DVD Case? Thomas Jefferson and Andrew Jackson understood "The Monster". 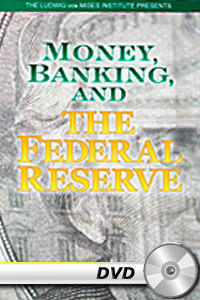 But to most Americans today, Federal Reserve is just a name on the dollar bill. They have no idea of what the central bank does to the economy, or to their own economic lives; of how and why it was founded and operates; or of the sound money and banking that could end the statism, inflation, and business cycles that the Fed generates. This documentary traces back the roots of economic instability in the U.S. to the Federal Reserve in a manner, which is not found in most "conspicacy-flicks": It's logical, backed by historical facts and interviews. Overall convincing and - beware - leaves the audience with a feeling of powerlessness. Poor sound engeneering though, especially during interviews, where the background drowns the speech. GOOD resource for information on the corruption of the FED. This video is very informative. It explains things about the Fed that most people don't know. I would highly recomend it to anyone who wants to investreal money for their retirement. I just wish they sold the video at a bulk rate discount.